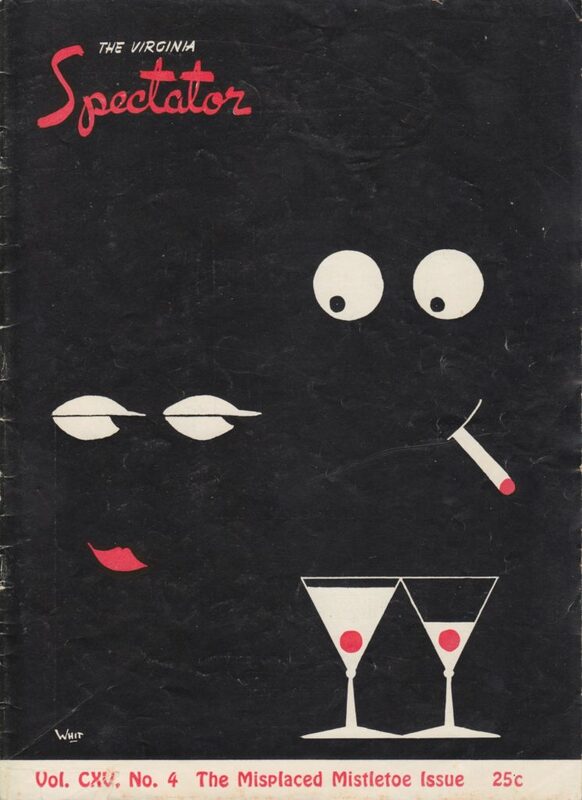 In the 1940s and 1950s, the former Virginia University Magazine / University of Virginia Magazine, the literary magazine at the University founded by the Washington and Jefferson Literary Societies, had become a men’s magazine in the mold of Esquire. Jokes, dating advice, and parodies ruled. But I’m not sure they ever exceeded the conceptual brilliance of the December 1953 issue (volume 115, number 4), also known as “The Misplaced Mistletoe Issue.” Featuring woodcuts (which we’ll look at another time), a Christmas story, and a suggestive cocktail themed cover, the whole package provides a humorous, if sexist, dose of holiday mirth. 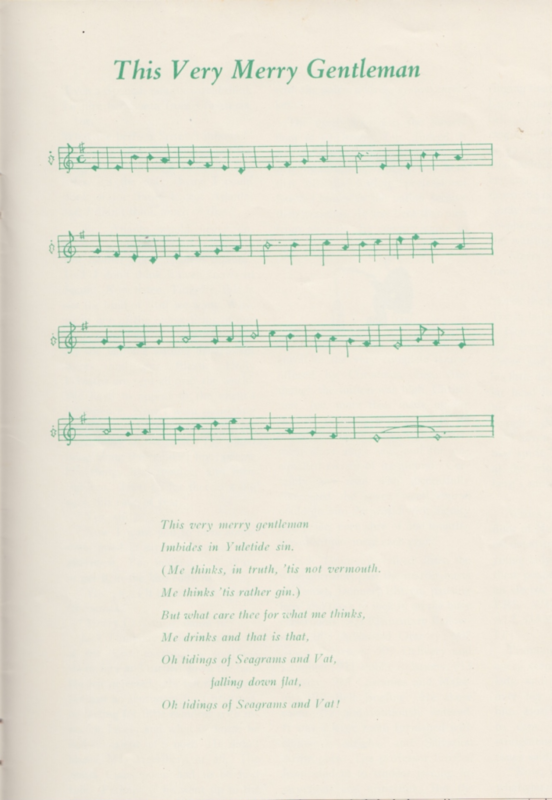 The best bit of all is the eight page carol book, “A Treasury of Yuletide Song,” stapled into the center. Featuring such titles as “Lament of a Reindeer at Christmas Time,” “Advice to All Those Who Think That Being a Civil Engineer is the Greatest Form of Life, or Rudolph, the Red-Nosed Wahoo,” and “Sexual Misbehavior of a Female Reindeer, or I Saw Donner Kissing Santa Claus,” the apex (or nadir, depending) is “Wreck the Halls, Carouse, and Volley,” which ends with the admonition “Neck with molls and fraus of folly … Don’t forget to use protection / Oui-oui-oui, oui-oui-oui, oui-oui-oui! / Or you’ll get a bad infection, / V.D.D.D.D.D.D.D.D.” Besides making “Rugby Road” look tame, the songbook confirms that the early 1950s at Virginia were a different time. Below is a relatively presentable excerpt from the songbook, showing that bourbon was not always the exclusive tipple of the Cavalier. Enjoy.